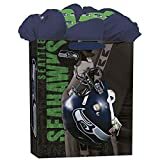 The Seattle Seahawks Large GoGo Gift Bag is great for all occasions! Don't just show up to a party - show off your team spirit with the most beautifully wrapped gift! GoGo Gift Bags come with built-in, color coordinating tissue paper. Just add your gift, fluff the tissue paper and you're set! Dimensions: 10.5”W x 12.5”H x 5”D.